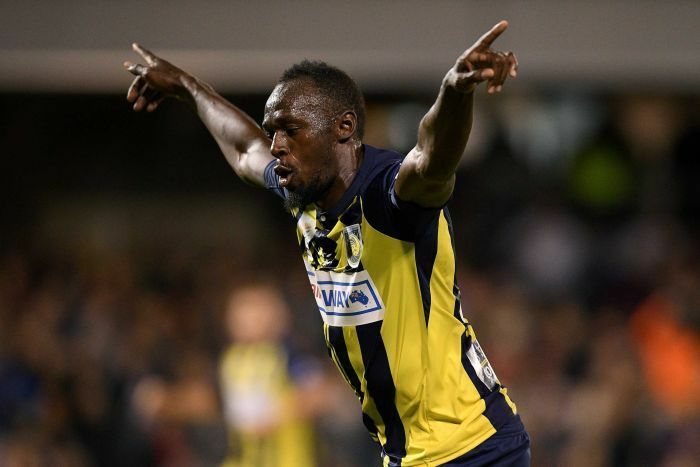 World’s fastest man Usain Bolt scored his first ever professional goal with Central Coast Mariners in a friendly. The Jamaican retired from athletics in 2017 after a medal-laden career. Since then, he has expressed his desire to play professional football. Bolt has previously trained with Borussia Dortmund, South African club Sundowns and Stromsgodset in Norway. “My first start and scoring two goals, it’s a good feeling,” Bolt said. “I’m happy I could come here and show the world I’m improving. I’m keen to be a Mariner, to play my best and get into the team,” added the Jamaican who is currently on a deal with the A-League side for an ‘indefinite training period’. Bolt scored two out of four goals as his team Central Coast Marines earned a 4-0 win over Macarthur South West. The 100 and 200m record holder’s teammates are all praises about him. “The best thing about Usain Bolt is he’s so humble. He’s fitted in well with the lads. From my first day even to where he is now, the transformation is huge.” said Ross McCormack who is on-loan from Aston Villa. To score his first goal, Usain Bolt picked a chip from teammate McCormack before slotting it past the goalkeeper. He doubled the number after taking advantage of a mix-up between the opposition’s goalkeeper and defender. His first goal was followed by the sprinter’s iconic ‘lightning’ celebration. The Australian A-League season will commence from 19 October and the Mariners are yet to confirm whether Bolt will be offered a full-time contract. How can India ever play in the FIFA World Cup if things are like this? 2018 FIFA World Cup Final – A David vs Goliath Encounter! Chelsea Keeper Thibaut Courtois Finally Moving To Real Madrid? The 10 Most Popular Football Club Rivalries in the World! Brazilian Footballer, Ronaldinho bids farewell to football.